Before using a routed command, you need to associated a particular command object with code for the Execute and CanExecute methods. You do this by creating a CommandBinding object that binds the command to the code. You then typically add that CommandBinding to the CommandBindings collection for the top-level window. 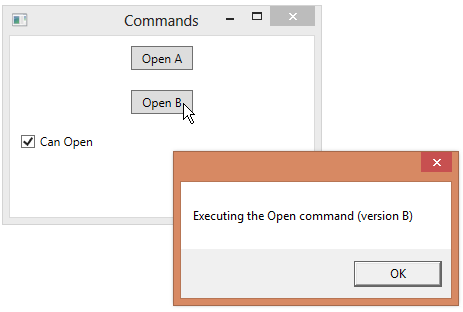 If you want to use the same command object, but bind it to different executable code for different UI elements, you can instead add the CommandBinding objects to the CommandBindings for individual elements. 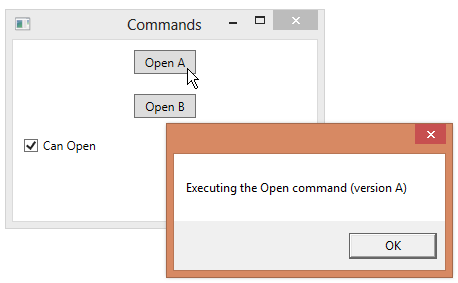 In the code below, we create two different bindings for the ApplicationCommands.Open command.